One more June, one more graduating cohort. I’ve only been a professor for a few years, but one of the singular joys of the job is the right to sit upon the stage as the new graduates strut in front of the VIPs to receive their fresh diplomas. The grads are decked out in the generic, standard black academic gown. The people on the stage? Well, we are (supposed to be) a kaleidoscope of magical hues and shades. Here’s how it works. 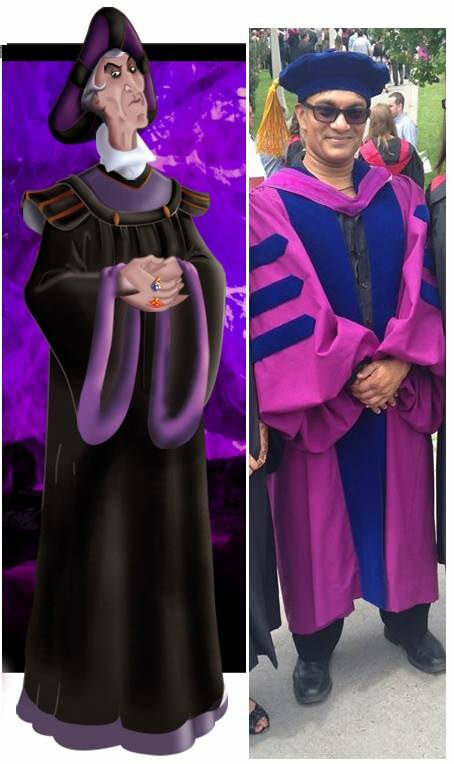 You’re supposed to wear the gown of the University from where you received your doctorate. Each school maintains its own style and colour. The hood of the gown, however, represents the discipline in which you are supposedly an expert. There isn’t a global standard for this, but in the USA (and, I think, Canada) the colour scheme is defined thusly, with health-related stuff being various shades of green. Further rules about the costume code can be found here. Apparently, most Canadian schools follow the British Oxfordian or Cambridge colour schemes. The idea is that represented on stage should be a diverse set of styles and colours representing the intellectual complexity of the institution. Multiple colours suggest that the school covers a wide range of disciplines. And multiple styles suggest that the school benefits from a faculty chosen from a wide array of schools. So why then does my regalia stand out every year? When you get a doctorate, you have the option of buying the the gown of your school and discipline. But recent doctoral grads are bitter and poor. No one has the cash to pay for these overpriced garments, which will only be worn once you secure an academic appointment, and even then only once or twice a year. Once we become well paid professors, however, you would think there would be an incentive to acquire the appropriate gown. But no, because we are also lazy, cheap, and overworked. So while it may occur to some of us, there really isn’t a great incentive to buy a gown… not when you can spend the same money on a weekend trip to someplace warm. The result is that most professors (at least at convocations I’ve attended) just wear the default robes of the university at which they work. The result: a high degree of homogeneity on stage. The further result: me standing out like a flamboyant interloper each and every year. 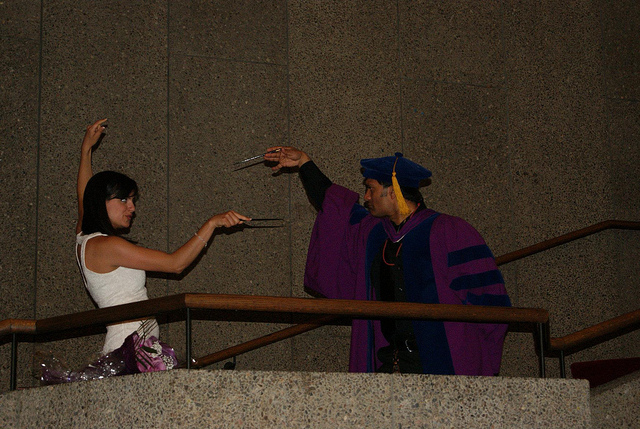 Mind you, I couldn’t afford a gown, either. When I became a professor, I went on Craig’s List and bought the gown of a deceased fellow from his widow. This fellow graduated in the early 1970s, almost 3 decades before me. And his discipline was in the Arts (hence a blue hood, not green). Thus, I am actually wearing the wrong regalia on stage. The way I figure it, I’m honouring both my scholarly tradition and that of this deceased scholar, whose regalia lives on in my adventures. So if you’re one of my students about to graduate, instead of asking me why I am dressed differently from the other professors on stage, ask one of the generically-dressed professors why they didn’t take the time to honour their school, their intellectual heritage, and the diversity of their faculty. That’ll show ’em. PS, pics from the most recent convocation can be seen here. PPS, meanwhile pics from my most recent trip to Guyana can be seen here.